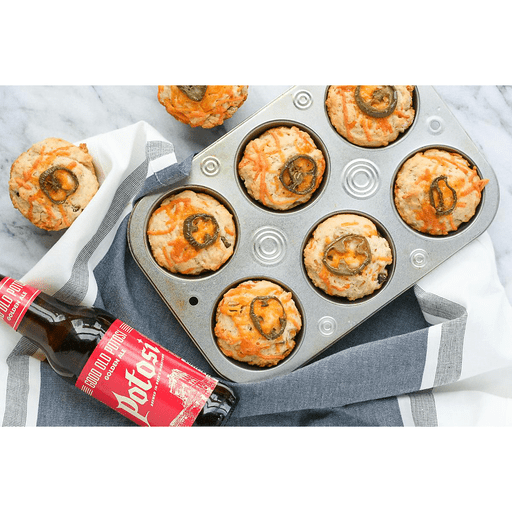 A little sweet and a little spicy, these Jalapeno Cheddar Beer Biscuits combine two of Wisconsin's favorite things - beer and cheese! A handful of simple ingredients come together to form buttery, fluffy biscuits that are the perfect complement to a meal or just enjoyed as a simple snack. 1. Preheat oven to 375°F. Lightly grease a standard 12-count muffin pan with cooking spray and set aside. 1. In a large bowl, whisk together flour, sugar, garlic powder, chopped jalapenos and ¾ cup of the cheese. 1. Pour beer into a medium bowl. Add the melted butter and whisk together until foamy. 1. Pour beer mixture into the flour mixture and fold until just combined. Batter will be thick and lumpy. 1. Divide batter evenly into the prepared muffin pan. Spread it out with a spoon so that it's roughly level. Top with remaining ¼ cup cheese and jalapeno slices. Bake until golden brown, about 25-30 minutes. 1. Remove pan from oven and let cool on a rack for 10 minutes. Remove biscuits from pan and serve warm or at room temperature. Calories 230, Total Fat 11g (Saturated 6g, Trans 0g), Cholesterol 30mg, Sodium 550mg, Total Carbohydrate 26g (Dietary Fiber 0g, Sugars 2g, Includes 2g Added Sugars), Protein 5g, Vitamin D 0%, Calcium 15%, Iron 6%, Potassium 2% *Nutritional values are an approximation. Actual nutritional values may vary due to preparation techniques, variations related to suppliers, regional and seasonal differences, or rounding.